OTTAWA -- Opposition MPs plan to demand Wednesday that former attorney general Jody Wilson-Raybould be allowed to return to the justice committee with no limitations on what she can say about the SNC-Lavalin affair. 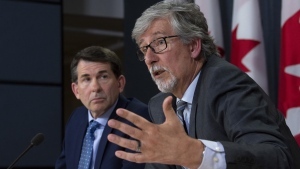 They also want the Liberals to agree to bring in several senior advisers and aides to Prime Minister Justin Trudeau, all of whom Wilson-Raybould says were involved in a sustained effort to get her to halt a criminal prosecution of SNC-Lavalin on charges of bribery. The director of public prosecutions opted last fall not to negotiate a remediation agreement with the Quebec-based engineering giant, which would have put off a criminal trial in exchange for the company admitting wrongdoing, paying fines and allowing itself to be monitored for a period of time. Wilson-Raybould did not overrule that decision, and says Trudeau and his staff pressured her to change her mind. If convicted at trial, the company would be barred from bidding on federal contracts. Trudeau has insisted any interactions his office had with Wilson-Raybould were an effort to try and prevent the innocent workers at the company from losing their jobs due to the criminal behaviour of others. The committee meets Wednesday afternoon at the request of the Conservatives and NDP, who want to move motions to recall Wilson-Raybould, as well as to request the appearance of senior aides to Trudeau and Wilson-Raybould's former chief of staff. Wilson-Raybould appeared Feb. 27 for about four hours, but after Trudeau's former principal secretary Gerald Butts testified a week later, opposition MPs say they have new questions for the ex-justice minister. None of the Liberals who are full members of the committee responded Tuesday to queries from The Canadian Press. Trudeau's chief of Staff Katie Telford, senior advisers Elder Marques and Mathieu Bouchard and Ben Chin, the chief of staff to Finance Minister Bill Morneau, all need to come to explain their role, said NDP MP Tracey Ramsey. "There were 11 people that the former attorney general mentioned that were involved in this entire affair and all of those people should be before the committee," she said. "Otherwise we're just leaving it up to speculation." Committee chair and Liberal MP Anthony Housefather said he called the meeting to be in public, but any member of the committee can request the discussions take place in private. Discussions about potential witnesses typically take place in-camera. 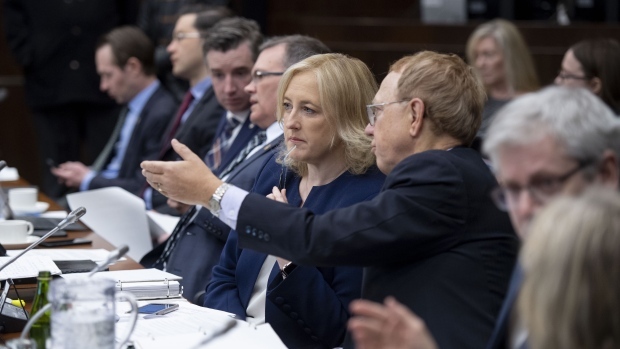 Conservative MP Michael Cooper said it is essential for the discussion to be out in the open because not allowing Wilson-Raybould to speak again is obstructing the committee's ability to fully study the matter. "If the Liberals are going to put forward arguments against hearing from Ms. Wilson-Raybould to be able to come to committee to be able to tell her full version of events," Cooper said, "it is imperative that they do so in public, in front of the cameras where there is a transcript and a recorded vote so that Canadians can see for themselves just what the Liberals are trying to do." Trudeau also needs to extend the confidentiality waiver he issued to allow Wilson-Raybould to talk about matters that normally would be protected by cabinet confidences or solicitor-client privilege, Ramsey added. The waiver covers the entire time she was the attorney general on any matters related to her use of her legal authority to direct the public prosecutor on the SNC-Lavalin file. The opposition wants to be able to ask about the period after she was shuffled from Justice to Veterans Affairs in mid-January, including why she resigned from cabinet. Prime Minister Justin Trudeau has already said the existing waiver allowed Wilson-Raybould "to address this matter expansively and in detail," which he said is what she did two weeks ago.